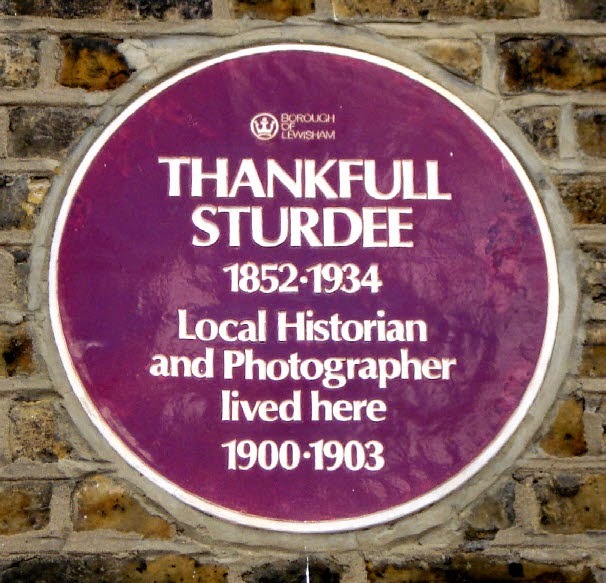 Thankfull Sturdee was born in Deptford April 24th 1852 and Christened June 27th 1852 in Deptford. He was married to Catherine Sarah Bland (b Deptford 1854) in 1883 and had 1 son and 1 daughter. He is listed as living and working at the following places. 16 Bolden Street from 1900 to 1903. 157 Malpas Road, Deptford 1909 - 1910. 1881: photographer living at 252 Evelyn Street, Deptford. 1901: photographer living at 16 Bolden Street, Deptford. 1912: photographer living at 151 Manor Road, Brockley, Deptford. 1917: photographer living at 26 Geoffrey Road, Brockley, Deptford. He Joined the Daily Mirror as staff photographer September 1911, retired 1922. Above is a Commemorative plaque from Lewisham Borough Council fixed to Studio 2 in Bolden Street. He died at 26 Geoffrey Road, Brockley, Deptford April 3 1934. I am researching for a new family history series which traces back to a family who lived in Deptford in 1900, and would love to share more.